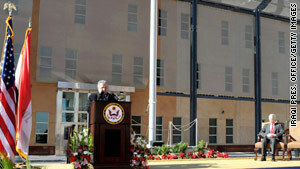 Iraqi President Jalal Talabani speaks at the January opening of the new U.S. Embassy in Iraq. Washington (CNN) -- The State Department's Inspector General's Office is criticizing both a private contractor and U.S. government officials for "considerable construction deficiencies" in the new U.S. Embassy in Iraq. In a report released Thursday, Acting Inspector General Harold W. Geisel lists incomplete design work, safety questions and maintenance problems that he says may continue for years. The report recommends that the State Department try to get a $132 million refund from the major construction contractor, First Kuwaiti Trading and Contracting. The embassy -- the largest such U.S. facility in the world -- ended up costing more than $700 million, with First Kuwaiti receiving more than $470 million. The compound includes working space for more than 1,000 people and housing for several hundred. It officially opened in January. A special office set up by the State Department to oversee the construction of the Baghdad Embassy failed to carry out its administrative responsibilities or enforce the provisions of the contract, the report says. The State Department says in the report that procedures for future projects will be different. One problem cited by the Inspector General's Office is inadequate emergency "safe areas" inside the embassy compound. It suggests the State Department try to recover $4.6 million "to repair safe areas, which are vital to protecting staff in emergency situations but which were not constructed according to contract specifications." "We found that although the construction ... [of the embassy] in a war zone in 34 months was a significant accomplishment, considerable construction deficiencies remained because designs for the facilities had not been completed and approved and quality control and commissioning procedures were inadequate," the report says. "Without a valid design and robust quality control and commissioning activities, the department cannot be assured that the NEC [new embassy compound] complies with contract and department requirements, as well as with applicable building codes," it says. The report, which was sent to Congress earlier this week, adds, "As a result of construction deficiencies, incomplete and undocumented design work, additional maintenance charges attributable to inadequate quality control and commissioning procedures, and unrecovered liquidated damages and interest on unauthorized advance mobilization payments, we recommend that the Department of State attempt to recover more than $132 million from First Kuwaiti."